Here we come with details about U.S. Pottery Barn Friends & Family Sale! 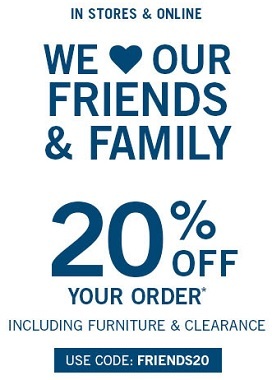 You can save 20% off your in-store purchase or online order. To receive the offe online use the promotion code FRIENDS20 at checkout. Offer is valid at U.S. Pottery Barn store locations and U.S. Pottery Barn online. Source of the information is U.S. Pottery Barn. For more details visit any U.S. Pottery Barn store location or U.S. Pottery Barn online.